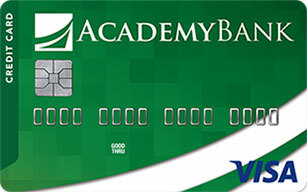 Your personal information is confidential and secure with Academy Bank. We will not share your personal information without your permission. You are applying for a secured credit card, a product designed to help establish or rebuild credit. You will need to deposit an amount into a savings account equal to the credit limit you are requesting. You can request an amount from $300 up to $3,000. As an example, if you are applying for a $500 Secured Credit Card, you will need to deposit $500 into a savings account. You will then be expected to make monthly payments equal to at least the minimum payment amount shown on your monthly statement. To help the government fight the funding of terrorism and money laundering activities, U.S. Federal Law requires all financial institutions to obtain, verify and record information that identifies each person who opens an account. As you open an account, we will ask you for your name, address, date of birth and other information that will allow us to identify you. We may ask to see your drivers license or other identifying documents. Legal Entities may be required to certify ownership and managerial control information. This information will be used for additional account verification purposes once your account has been established. It is used to identify you when you use forms on our website. This information will be used only if there is an issue with your account and we are not able to reach you. 1 Federal law requires that financial institutions obtain and verify personal information in order to open an account.